The Dark Shadows Festival will be hosting a tour of historic Sleepy Hollow Cemetery Sunday, July 29, as part of its weekend of fan events in Tarrytown, New York. Tickets are $9.99 and can be obtained online or on the day of the event. The tour begins at 5.30 p.m. following the Dark Shadows celebrity luncheon at the Tarrytown DoubleTree Hotel, which ends at 5. Those attending must provide their own transportation to and from the cemetery. This event will offer fans a rare opportunity to visit Sleepy Hollow Cemetery after hours and has been specially arranged for those attending the Dark Shadows Festival. 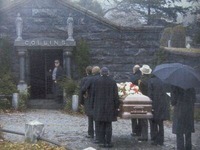 The cemetery featured prominently in the feature film House of Dark Shadows in scenes of the Collins family mausoleum and Carolyn's funeral. Source: The Collinsport Star, June 11, 2014. It doesn't explain if there will be a special event at the cemetery or some kind of guided tour. If it's just going to be everyone wandering around on their own, they could do that any time. According to the schedule, it's going to be a guided tour. The luncheon starts at 11:30 and at 1:30, there will be some kind of stage production. Then there are other events until 5 p.m., which will give people a half-hour to get to Sleepy Hollow Cemetery. I think that we should wear something comfortable, especially comfortable shoes, for the cemetery tour. I can't believe that it will last more than an hour and that will give us plenty of time to return to the hotel, change and be at Equus for dinner at 8. We could even try to change our reservation to 8:30, but we do have to get up early on Monday and start for Salem by around 8:30. 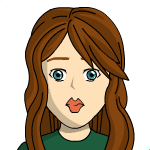 Don't one of you play the role of Carolyn, the one whose funeral was in the movie at Sleepy Hollow Cemetery? So tell us, how will the Carolyn character attend her own funeral? Who said anything about reenacting Carolyn's funeral?